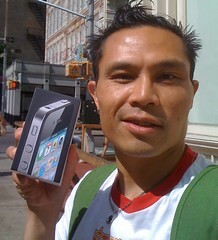 After only 1 hour and 19 minutes on line at the Soho Apple Store, I am now the proud owner of an iPhone 4. Don't hate! As someone who for the past three years has been rocking the original iPhone, with a measly 4 gigs of space, I'm more than due for an upgrade.